Because they dominate all terrestrial environments that support human life, insects are usually our most important competitors for food, fiber, and other natural resources. They have a direct impact on agricultural food production by chewing the leaves of crop plants, sucking out plant juices, boring within the roots, stems or leaves, and spreading plant pathogens. They feed on natural fibers, destroy wooden building materials, ruin stored grain, and accelerate the process of decay. They also have a profound impact on the health of humans and domestic animals by causing annoyance, inflicting bites and stings, and transmitting disease. The economic impact of insects is measured not only by the market value of products they destroy and the cost of damage they inflict but also by the money and resources expended on prevention and control of pest outbreaks. Although dollar values for these losses are nearly impossible to calculate, especially when they affect human health and welfare, economists generally agree that insects consume or destroy around 10% of gross national product in large, industrialized nations and up to 25% of gross national product in some developing countries. These and other aspects of economic entomology will be our main emphasis in the final section of this course when we focus entirely on insect pests and the tactics used to control them. But despite the tremendous economic losses they may cause, it is not entirely fair to cast the members of Class Insecta as villains who rob us of our food and livelihoods. They are also cherished allies on whom we depend to keep the natural environment clean and productive. They have shaped human cultures and civilizations in countless ways, they supply unique natural products, they regulate the population densities of many potential pest species, they dispose of our wastes, bury the dead, and recycle organic nutrients. Indeed, we seldom stop to consider what life would be like without insects and how much we depend on them for our very survival. To paraphrase William Shakespeare, "The evil that insects do lives after them, the good is oft interred with their exoskeletons." Insects represent an important food source for a wide variety of other animal species. Freshwater game fish such as trout, bass, and bream feed extensively on aquatic insects like mayflies, stoneflies, or hellgrammites. Artificial "flies" used by anglers are often made to resemble a fish's natural prey. Many toads, frogs, turtles, snakes, and lizards also consume insects as a major part of their diet. Insectivory is common among land-dwelling birds. Purple martins, barn swallows, vireos, warblers, flickers, whippoorwills, and swifts, for example, survive almost exclusively on insects. Other birds (such as egrets, quail, geese, plovers, snipes, and bluebirds) have a more varied diet, but they still derive a large percentage of their total nutrition from insects. There are even some insectivorous mammals: shrews, moles, bats, armadillos, and anteaters, for example. 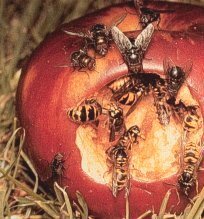 When other food is scarce, even foxes, racoons, skunks, and bears will turn to insects as a source of food. Insects were undoubtedly an important source of nutrition for our early human ancestors. Even today, they are still collected and eaten by people of many cultures. In Mexico, dried grasshoppers are sold in village markets. High in protein and low in fat, they may be fried or ground into meal and mixed with flour to make tortillas. 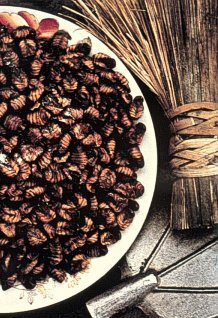 Sago grubs, the larvae of a wood-boring beetle, are considered a delicacy in Papua New Guinea. The islanders boil the larvae or roast them over an open fire. Ants, bees, termites, caterpillars, water bugs, beetle larvae, flies, crickets, katydids, cicadas, and dragonfly nymphs are among a long list of edible insects that provide nutrition for the people of Australia, Africa, South America, the Middle East, and the Far East. Indeed, Americans and other descendents of western European culture appear to be unique among peoples of the world in having such a strong cultural taboo against the use of insects as food. In a saucepan, melt margarine and marshmallows. Remove from heat and stir in cereal and maggots. Spread mixture in a 9x13 greased pan and allow to cool. waste products from large herds of cattle and other ungulates (mammals with hooves) would soon render much of the landscape unsuitable for agricultural purposes. Faced with just such a situation, ranchers in Hawaii, Australia, and the southern United States have imported dung beetles from East Africa in an effort to accelerate the decomposition of manure on pasturelands that support large herds of livestock. As parasites and predators of other organisms, insects are part of a natural system of checks and balances that strengthens community stability and prevents explosive population growth from overrunning natural resources. So far, over 6000 insect species have been tested and released as biological control agents to fight insects and weeds that we regard as pests. But there are also countless other species that work for us as population regulators, often unnoticed until they are accidently destroyed by a natural disaster or human intervention. Indeed, human disruption of natural ecosystems is a common cause of pest outbreaks. Over half of all agricultural pests in the United States have been accidently imported from abroad: e. g. fire ants from South America, Japanese beetles from the Orient, and gypsy moths from Europe. Many of these species are not regarded as serious pests in their homelands because population growth is suppressed by native parasites, predators, and diseases. But above all else, insects play an essential role as pollinators of flowering plants (angiosperms). These plants are dominant producers in many terrestrial ecosystems, but they cannot reproduce without insect intermediaries to carry pollen (the male gametophyte) from flower to flower. It is a close symbiotic relationship that has been shaped and polished by eons of co-evolution. The plants produce a wide array of colors, odors, rewards, and ruses to attract or seduce their insect accomplices. Each flower's architecture is specially designed to insure that insect visitors do not leave without a thorough dusting of pollen -- destined, perchance, for the stigma of another flower nearby. Various flower types are adapted for luring different groups of insects -- not only bees and butterflies but also many species of wasps, moths, beetles, and flies. Wild ginger, for example, produces an unobtrusive brown flower that smells like a dead rat. It is pollinated by fungus gnats, flesh flies, and other saprophytic insects. Many of our agricultural crops like almonds, apples, cherries, blueberries, cucumbers, squash, melons, etc. would be non-productive without insect pollinators. In the United States, there are more than 250,000 commercial and hobby beekeepers who manage over four million beehives and provide pollination services to crops on 20-25 million hectares of farmland each year. These services cost growers about 50 million dollars annually, but they produce a net gain of over nine billion dollars a year through increased yield and quality of agricultural products. Wild bumblebees and certain species of solitary bees (e.g., Nomia melanderi and Osmia spp.) are also important pollinators for the production of alfalfa seed and some fruit crops. 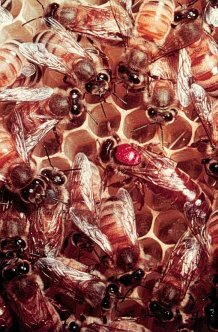 Since ancient times, honey bees (Apis mellifera) have been valued for the honey and beeswax they produce. In many cultures, these products, as well as the bees themselves, are viewed with mystical or religious significance. To ancient Greeks and Romans, honey was the "nectar of the gods" -- endowed with healing properties and super-natural powers. People of Asia used it as a preservative for fruits and cakes, Egyptians employed it as an embalming fluid, and doctors in Europe and colonial America applied it as an antiseptic to treat burns and lacerations. In Europe, honey was often mixed with wine or beer and could be fermented to produce a popular alcoholic beverage known as mead. For many thousands of years, honey was the only sweetener most people ever used. The crystalline form of sugar sold today was not readily available until the early 1800's when the first commercial refineries were built to extract sucrose from cane or beets. this honey is used as a primary sweetener or as a substitute for refined sugar in baked goods. It is also an ingredient in a few cough medicines and laxatives. Specialized glands on the ventral side of a worker bee's abdomen secrete flakes of beeswax, a soft, malleable material that bees use to build the comb where honey is stored and larvae are reared. The wax has a relatively low melting point so it is easy to extract and purify with heat. Beeswax is still used commercially in the manufacture of cosmetics, candles, furniture waxes, leather dressings, waxed paper, inks, and medicinal ointments. Annual U.S. production is about 2 million kilograms. In recent years, there has been a growing market for bee pollen and royal jelly, two other products derived from honey bees. The pollen is collected when worker bees squeeze through a special screen at the hive entrance which dislodges pollen from the hind legs. Some nutritionists regard bee pollen as a "complete" dietary supplement. 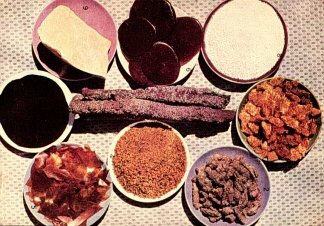 It is sometimes sold in health food stores, often with astonishing claims for its medicinal or restorative powers. Royal jelly is a glandular secretion that nurse bees feed to larvae of future queens. It is rich in vitamins and proteins, and is also sold for its curative properties. It has become a major ingredient in some expensive skin care products that promise to reduce wrinkles and retard aging. 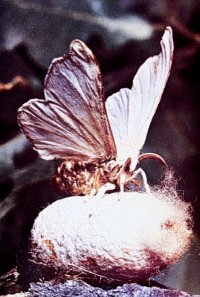 A silkworm, Bombyx mori, is the source of a unique natural fiber used to make silk cloth. This species now exists only in captivity where it is reared to maturity on a diet of mulberry leaves. As each larva spins its cocoon, it produces a continuous fiber of silk that is about 0.075 mm (3/1000 inch) thick and 900 to 1500 m (3000-5000 ft) in length. This "domestic" silk is highly valued for its light color and lusterous finish. Silk is also harvested from the cocoons of several other moth species (mostly Antherea spp.) that live in the forests of India, China, and Japan. These "wild" silks (Eri, Yamamai, Muga, and Tussah are the most common types) tend to be heavier, darker, and less highly valued than that of Bombyx mori. Silk is the strongest of all natural fibers. It is comparable to steel or nylon in tensile strength, but considerably more elastic. It can be dyed, spun into thread or yarn, and woven into fabrics that are warm in winter, cool in summer, resistant to wrinkling, and exceptionally light in weight. Until the discovery of nylon in 1938, silk was the only fiber strong and light enough to be used in the manufacture of parachutes, surgical sutures, and women's hosiery. Although it has largely been replaced by less expensive synthetic fibers in most manufacturing applications, there is still a strong demand for silk in today's textile industry. Commercial production is centered in the Orient (mostly China and Japan) where there is an abundant supply of mulberry leaves. Annual silk production exceeds 50,000 metric tons -- most of it woven into fabric for clothing or blended with other fibers for draperies and upholstery. Laccifer lacca, a tiny scale insect that grows on soapberry and acacia trees in India and Burma, is the source of lac, a sticky resin that forms the principle ingredient of commercial shellac. Twigs bearing the scale insects are heated to extract and purify the resin. Up to 200 insects are needed for each gram of lac (90,000 per pound). Shellac, made by dissolving the lac in alcohol, was widely used as a varnish (protective coating) for floors, furniture, draperies, photographs, playing cards, and dried flower arrangements. Alkali emulsions of shellac have been molded into electric insulators, phonograph records, and dental plates. Today, lac has been largely replaced by synthetic materials, such as polyurethane and vinyl, but it is still used as a stiffening agent in the fabrication of felt hats, leather shoes, sealing waxes, and various types of inks, dyes, and polishes. Lac is the only commercial resin of animal origin. Cochineal is a scarlet pigment extracted from Dactylopius coccus, a scale insect that lives on prickly pear cacti in Mexico and Central America. First used by Aztec Indians as a medicine, a textile dye, and a body paint, cochineal was discovered by Spanish conquistadors under the command of Hernando Cortez (1519). The pigment was highly valued for the intensity and permanence of its color and became a staple of trade with Europe during the 17th century. Cochineal was very expensive because of its scarcity [150 insects are needed to produce one gram of dye (70,000 per pound)], so it was used in only the finest fabrics. 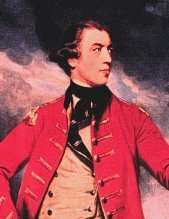 During the American Revolution, British soldiers, known as "red coats", wore uniforms dyed with cochineal. Today, the textile industry has largely replaced cochineal with less expensive aniline dyes, but it is still used as a coloring agent in foods, beverages, cosmetics (especially lipsticks), and art products. Tannic acid is a chemical compound widely used in the leather industry (for tanning and dying) and in the manufacture of some inks. Until the mid 1800's, most of the world's supply of tannic acid was obtained from the Aleppo gall, an abnormal plant growth found on oak trees in Asia Minor. The trees produce gall tissue in response to a chemical substance secreted by tiny wasps (family Cynipidae) that infest the trees. Larvae of these gall wasps live and grow inside the galls which unwittingly provide both food and shelter for the insect invaders. Today, there is no commercial market for oak galls because tannic acid can be extracted more economically from the quebracho tree, a South American member of the sumac and poison ivy family (Anacardiaceae).